After months of anticipation, multi-platinum selling, Grammy-nominated Chicago band Fall Out Boy release their seventh studio album M A N I A today on Island Records/DCD2 Records. The album is available across all DSPs NOW. The band also released a new music video for the track “Church” directed by Daveion Thompson – watch HERE. Fall Out Boy will play Greensboro Coliseum on Friday, September 14. American Express® Card Members can purchase tickets before the general public beginning Monday, January 22 at 10am through Thursday, January 25 at 10pm. Tickets go on sale to the general public starting Friday, January 26 at 10 a.m.. For complete presale details and ticket information, please visit www.ticketmaster.com. $1 from every ticket sold will go to the Fall Out Boy Fund benefiting charities throughout Chicago. Prior to the U.S. run, the band will continue their global tour with dates across Australia, New Zealand, Europe and Asia. 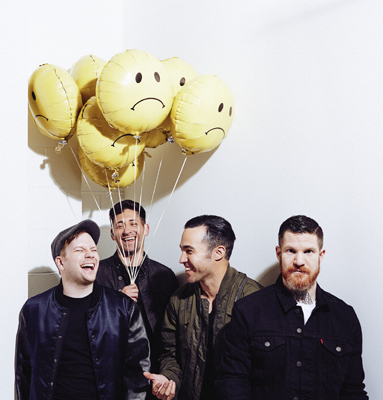 For a complete list of tour dates, please visit https://falloutboy.com/tour. On September 8, Fall Out Boy will return to their hometown for a special homecoming milestone – their first-ever headline show at Chicago’s iconic Wrigley Field. The band previously performed at Wrigley as MLB’s first-ever live musical performance on Opening Night in April 2015. Most recently, Fall Out Boy took over the 7th inning stretch and sang “Take Me Out To The Ballgame” on September 16, 2017 when the Cubs hosted the St. Louis Cardinals – a game at which Pete Wentz also had the honor of throwing the game’s ceremonial first pitch. The band celebrated the album’s release this week with performances on The Late Show with Stephen Colbert last night and Good Morning America this morning, along with an appearance on MTV’s TRL on Wednesday. They will perform on The Late Late Show with James Corden on January 31.